Having enjoyed some of the most comfortable sailing I can remember, the Queensland coast will remain in my memory as a glorious place to sail. We had enjoyed the most gorgeous weather, fabulous wind conditions and truly breathtaking scenery. 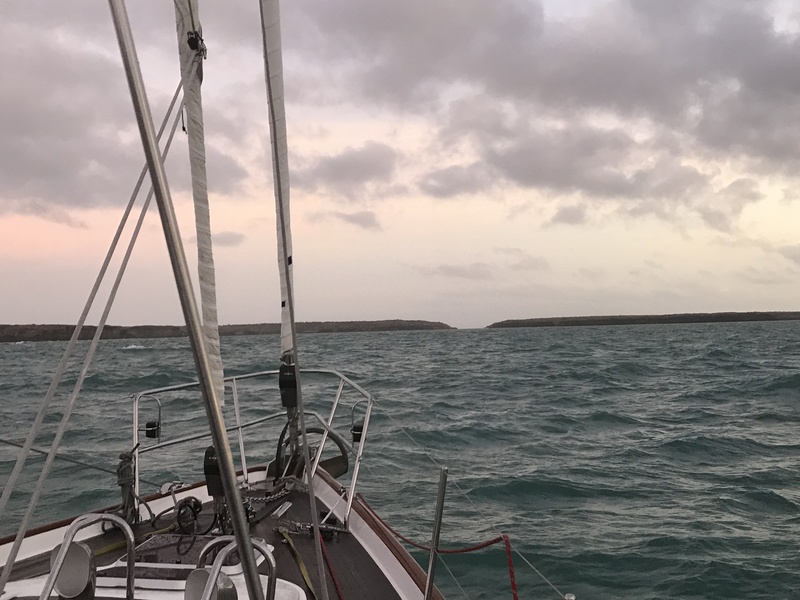 On the 11th July we rounded the furthest most Northerly point of Australia, ‘Cape York’, leaving the Coral Sea behind us and entering the Arafura Sea, to cross the Gulf of Carpentaria, . This is where things got a little uncomfortable, it was as if the Coral sea and the Arafura sea were in a battle for supremacy, the seas were confused and we were rolling from gunnel to gunnel. Even with all the sails out, sailing wing on wing, the rolling wouldn’t be stilled. It meant that any attempt to do anything below was almost impossible, and anything not secured or tied down was sliding around the boat with reckless abandon. ‘Our diet was to be toast and cup-a-soup until the seas behaved themselves again! 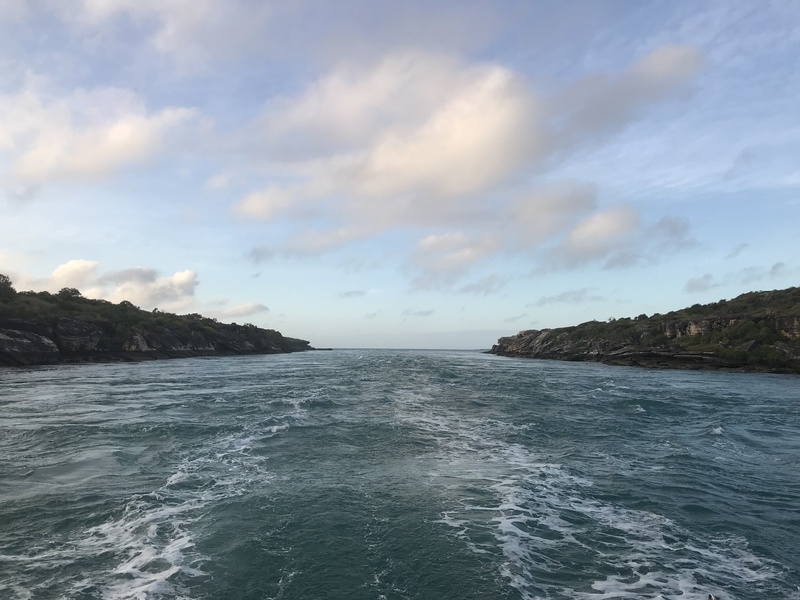 At 6:30 this morning, Saturday 14th July we approached Wessel Islands, two long narrow Islands off the Northern Territory coast, the Islands are called Guluwuru Island and Raragala Island. There is a good size pass between the two islands, but there’s also a narrow cut in one of the Islands just one mile long and approximately 100 meter’s wide, through the island of Raragala, it’s called “the Hole in the Wall”. This was reputed to be “something not to be missed” (by some air-head) as long as you hit it at exactly the right time, so as to have favorable current. Bob’s night watch was officially finished at 7am as we approached the Hole in the Wall, but thankfully he stayed on the helm, to take us through. Don was frantically manning the GPS and watching our way through on the screens, and passing the info to Bob. I had just poked my head up through the companionway in time to see us approaching the entrance, (thanks for waking me guys! ) I asked to be woken this morning, so I wouldn’t miss going through. Unfortunately no one bothered to come and get me, they were all too busy on the fore deck with their phones photographing our approach. Fortunately (or maybe not, as it turned out) I woke just in time to come up on deck and see our approach. I couldn’t believe we were actually going to attempt to squeeze through this little gap in the Island, had everyone on board lost their marbles? It really didn’t look like a sensible choice to me, but then, what do I know? As we approached the entrance, it looked really narrow and the water appeared very disturbed with lots of Eddys and strong tide, it was moving towards us, at 3 to 4 knots. But then only 10% of the way through the pass, the current started to increase until it reached 9 knots with 18-20 knots of wind behind. The pass was only a mile through, and even though the engine was at 1800 revs the boat came to a complete halt time after time, with still 3/4 of a mile in front of us. Our average speed was 0.01 knots. Bob had to fight with the helm to keep the boat steady and pointing in the right direction. Turning around was not an option, the current was so strong and the pass too narrow, our progress (if any) was unbearably slow, coming to a complete halt every few minutes. I kept staring at the sides of the pass for confirmation that we were moving at all. Mostly the speed stayed at 0.01 knots to 0.00 knots. Glenn and Stuart put the jib out, hoping that this would give us some extra power, it didn’t! The water just seemed to be rushing past us at incredible speed. It felt as though we were attempting to sail up a waterfall. We were basically dead in the water with the engine at almost full revs! My imagination was on it’s spinning wheel going for Gold. Eventually Bob increased the revs by another 400, we were at maximum revs now with the jib full out and still our progress was barely more than 0.03 frequently dropping down to 0.00 knots. It was a fight at the helm the entire passage through; the one mile pass took us one hour and fifteen nerve racking minutes. 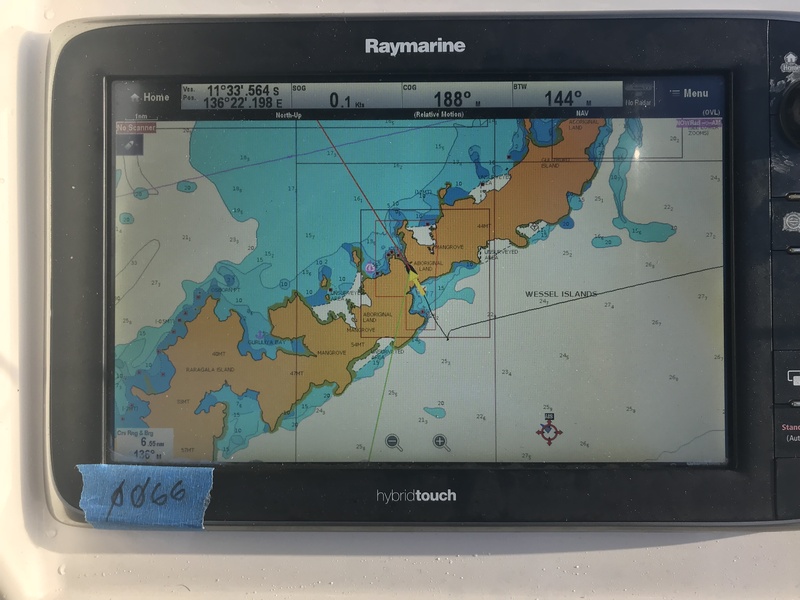 The depth dropped to just 2.2 meters below the keel at one point, as Bob & Don tried to navigate through avoiding the strongest currents with Don passing on the GPS information. This was not fun. We had timed it so wrong for the current and tide, this error could easily have proved disastrous, However, my brilliant husband “Crazy Daisy’s Captain Bob”, and True Blue’s Captain Don navigated True Blue safely through.